Shi Xing is the son of Tian who has a tragic and sad past haunting him. He is also the former Great God of the ferocious affiliation. 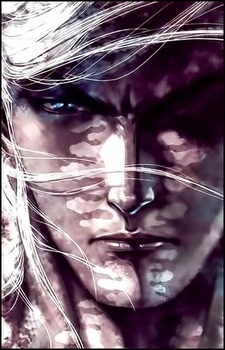 Shi Xing grew up in the God's domain, having Tian Kui as his teacher in battle techniques and master on life who taught Shi Xing and passed down the knowledge and experience about the world of people. As Shi Xing was becoming older he became a very strong warrior, he was told to go to the world of people with the goal to learn how to rule over the humans. In the human world, Shi Xing met a blind and kind young woman named as Ming Yue. Shi Xing eventually fell in love with Ming Yue and they became a couple. Shi Xing changed his mind about the humans and said to his superiors that in the land that Shi Xing rules, the humans are gods equals. Later as it was revealed, by Shen Yen's will, Tian Kui and Xin Yue Kui came to punish Shi Xing. Tian Kui who hadn't other choice, in order to spare Ming Yue from such pain, he beheaded Ming Yue with his bare hands, in front of Shi Xing. In season 1, Zi Yu managed to defeat Shi Xing in his cursed form, in season 2 Shi Xing returns back in his original self and he made a pact with the Immortal Phoenix. Immortal Phoenix told Shi Xing that he can give him power beyond his imagination while eating away Shi Xing's lifeforce until his transcendent vigor depletes. Shi Xing's cursed body fused with the Immortal Phoenix and it made him way much stronger than before. He was able to defeat and kill Tian Kui after a great battle but Shi Xing's wrath hasn't completely ended, his revenge towards Shen Yen is still ongoing and he will try to destroy Shen Yen no matter what. He battles against the Sage King Xuan Feng, the battle ends in a tie with his disappearance by passing the Gates of Heaven. He is founded by the Gods and held prison inside the Crystal Cave until the Ancient Gods are revived and Liu Yue releases him to fight against them.